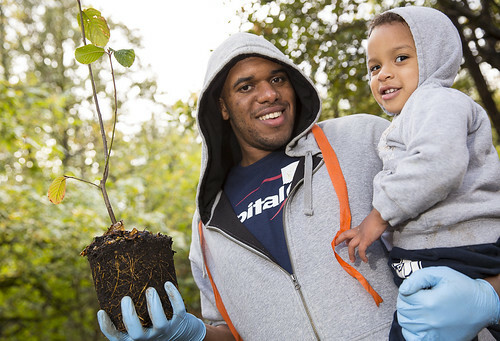 Join us at Veteran's Creek to care for native trees and shrubs in partnership with the Johnson Creek Watershed Council and Portland Parks & Recreation with support from East Multnomah Soil & Water Conservation District and Metro. Please arrive around 8:45am to be registered and assigned to a crew. **We ask that volunteers meet at SE 98th & SE Mt. Scott Blvd. No parking is available along Mt. Scott Blvd, but street parking is available along SE 98th and adjacent neighborhood streets. Out of courtesy to the neighbors, please DO NOT BLOCK neighbors’ driveways. ** The event will start promptly at 9:00am. We provide breakfast snacks and hot chocolate/coffee, as well as gloves, tools and guidance. Please come dressed for the weather and wearing sturdy shoes and get ready to have fun! Please contact the Friends of Trees Volunteer & Outreach Team at (503) 595-0213 if you have any questions or need more information. We look forward to seeing you out there!